The book is filled with Adam’s personal experiences as a college minister and hospital chaplain. So much of what he wrote about college ministry, particularly in regards to evangelism, resonated with me. Campus ministry, with its ubiquitous emphasis on evangelism (that is, walking up to people you don’t know and talking to them about the deepest, most personal things in the world), can be a nightmare for introverts. I experienced this both as a student and as a staffer, and I can affirm that the subtle (or sometimes not so subtle) message to introverts is: the path to spiritual growth, for you, lies in changing your personality. Extroversion, on campus and throughout evangelicalism today, is spiritualized. Of course, extroverted spirituality is not the only viable spirituality. Introverts bring a spirituality that is much needed in this fast-paced, shallow, tweet-induced 140 character world we live in. Introverts prefer slowness and depth. We need to process internally rather than speaking our thoughts as they come to us. We are reflective and contemplative. We tend to listen well. 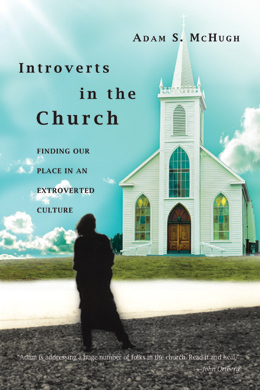 The church, and for that matter the world, need both extroverted and introverted spirituality in order to thrive. For any of you introverts who have been burned by an extroverted culture or church, please consider picking up this book. You will find in it the words of someone who understands. You will find a friend. And, I trust, you will begin to find some healing.